The Gentleman Crafter: Last Post For Tonight! Well, I'm tuckered out! Going to eat and stop for the evening and watch a little Harry Potter! LOL! Has anyone started J.K. Rowling's new book yet? Is it good? :) Let me know will ya? Wowzers! Love em all Jimbo, but my favorite is Ms. October!!! OMG...I'm in love. Are these FIGURES still available for purchase? Great display....all your vignettes are cool! Job well done....now go grab some well deserved nourishment, put your feet up and enjoy the flick! Thanks for sharing! What FUN!!! Thanks for sharing all the pictures today!!! LOVE Harry Potter!! I'd like to hear any reviews of the new book, too. Those are some pumpkins mr. Jim. Hope you can fall into your movie. You deserve the rest. I started a new book today and only got 6 pages in before falling into a nap with the dogs. tomorrow is another day. Slow down and enjoy it mr. Jim. 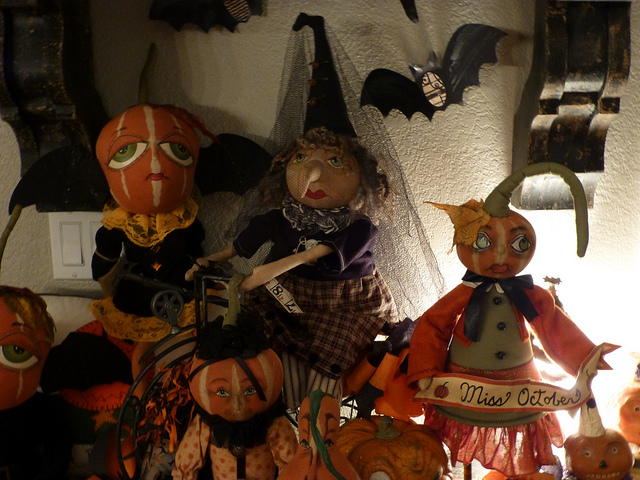 These are great, Jim....must've missed them, but I really like them,,,,your witch looks fabulous among them!!! Must find some of these...too much fun! oh my dear Jim, i do love your decorating touches.. looks amazing.. i used to decorate for every season but now that i am getting 'old' i just don't seem to have the energy :( however, i do enjoy what others do and you are good.. thanks for sharing.. The Halloween wall is great. The figures are so fun. Especially like the grouping up on the shelf near the bats. You have done a wonderful job of decorating. Thank You for sharing. Hope you enjoy your relaxation time. So Cool Jim. Love your collection. I use to love decorating for Halloween every year and enjoyed the trick-or-treaters. We lived on a court and all the neighbors were great about decorating and our court was truely a show place. We always got 300 to 400 kids file thru on halloween. And we also had tons of cars file thru at Christmas as well. Now we live in a very private and secluded area and absolutely no trick-or-treaters at all. Miss them a lot. However, with the twins approaching 3 years now, it will be fun to start celebrating Halloween again. This year we are all going to be spending Halloween at Disneyland, but next year I will have a traditional Halloween. You have out done yourself once again, time to kick off the shoes and settle comfortably on that couch for your movie night. Enjoy. Jim, the Joe Spencer folks are wonderful. Your home is so charming. I can't believe how much you accomplished in a day especially considering that you also were sharing via your blogs. Totally enjoyed it all. Thanks. I wonder if all your figures will still be in the same places tomorrow ..... or will they have moved around during the night?????? Spooooky! I absolutely love your collection of Joe Spencer. Your wall looks wonderful, what a great start for the Halloween season. I look forward to seeing more. The pillow and top hat on the chair is quite unique. Lovin' it! Wow! Fabulous display, Jim! Your Bike Witch fits right in! Cool bat wall too! What a fun display those are gorgeous art dolls. Those dolls are darling! I love all of their detail, their expressions are great! I love the way you displayed them. Are the bats from the same artist? I can see why you love them! I've heard mixed reviews on the The Casual Vacancy. It's adult though, not for children, and has lots of political plots. Let us know when you read it. 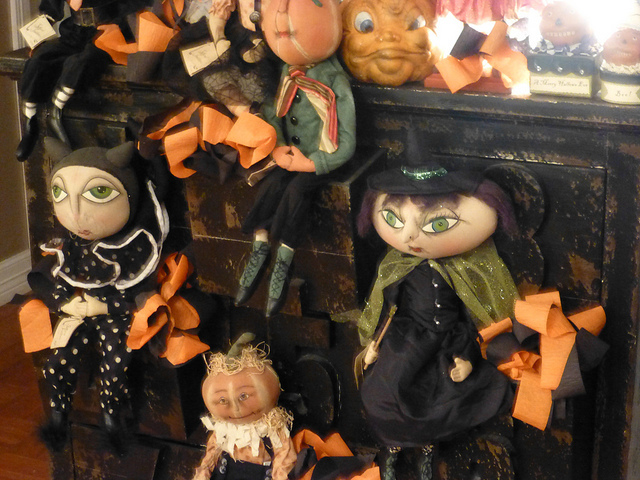 Your decor is crazy awesome....love those dolls, not really scary due to the whimsical feel. I didn't know about your witch...must go look that post up! The sun is out in Midland! Love the wall! 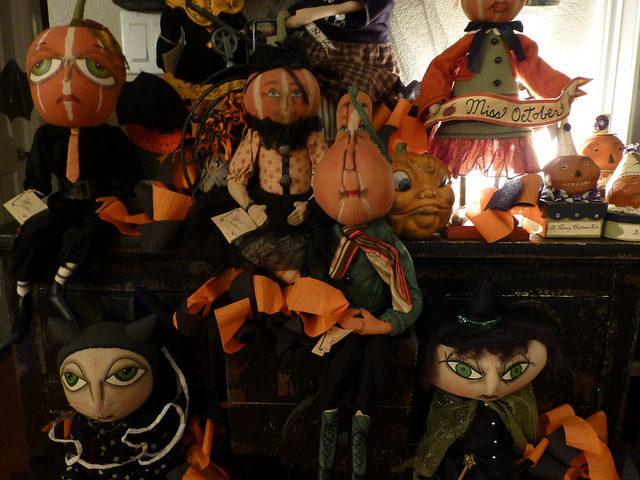 My favorites are, of course, the witches. I'm so glad you decorated because now I'm not the only person putting Halloween on display in September! Now I'm off to google Joe Spencer to see if I can find one for myself. Jimbug, love the Halloween collection. Your house is sooo charming and delicious. Especially love what you did with the bike. You my dear Gentleman Crafter are absolutely unbelievably brilliant! I absolutely love everything you have done and your bat wall is outstanding. Jim, you rock! Your Halloween decorations are FABULOUS!!!!! I will most definitely be stealing yourr idea of dressing up my pillows for the season...I absolutely LOVE that idea. Thank you for sharing! Off to Michaels I go! 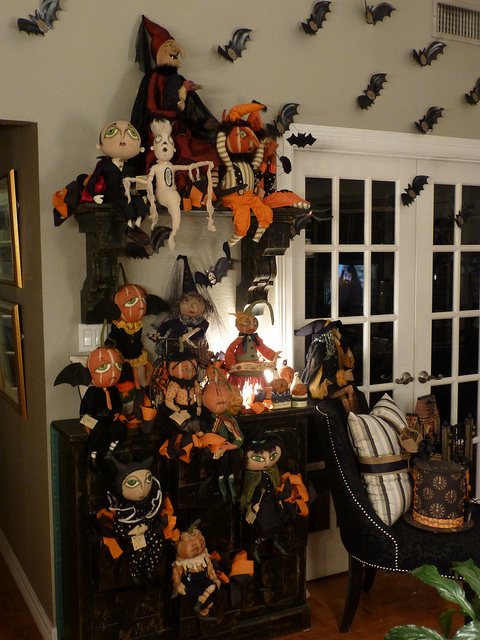 You are so amazing, I love your collections of stuff and things and dodads and geegaws....it is so much fun to see what you are up to and what you do with your wonderful creativity....your stuffed halloween figures are a real scream and your creations look amazing all set out around your house. thanks again for sharing. Awesome wall Jim. All the Halloween decorations are awesome! Love the stuffed figures and doesn't Broom Helga fit in well with the group! What a great collection, looks like a display you would see in Joe's shop. And your witch fits right in Jim. Wow Jim, you sure now how to do Halloween well! I love the pumpkins and the witches, and the fun way you placed the bats. I bet that must have taken some time. That little pumpkin coming out the draw had me the first minute I saw him! Those are the cutest "stuffed figures" :) You have such a great eye for display and decoration. Good Grief Man!!! There are no words....I love the little critters to pieces. Simply wonderful. Big Hugs! 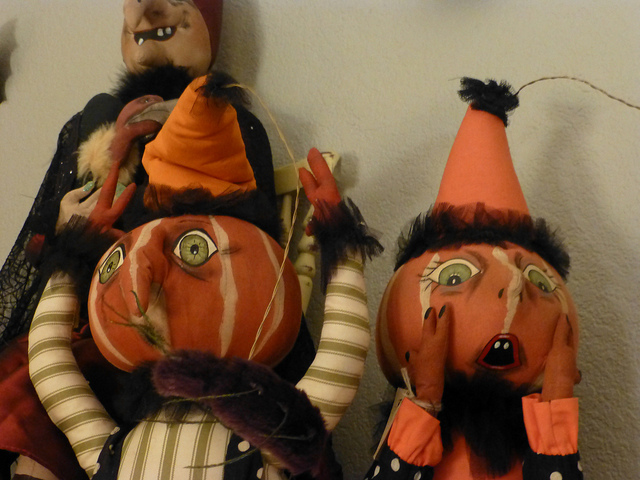 Wow, your Halloween decorations are just fantastic as too is your display wall! Love it! OH MY GOSH!!!!! JIM IS THIS YOUR HOUSE??? you did it IT LOOKS AWESOME...have fun on your mini vacation...and remember don't go totally dylusional on us...we luv as you are.. I can honestly say I have NEVER seen anything as cool as this. I would love one of those dolls!Just fanbloodytastic!